Flights at several airports in B.C. 's Interior and West Kootenay regions have been cancelled or delayed as wildfire smoke continues hang over the province. Flights at several airports in B.C. 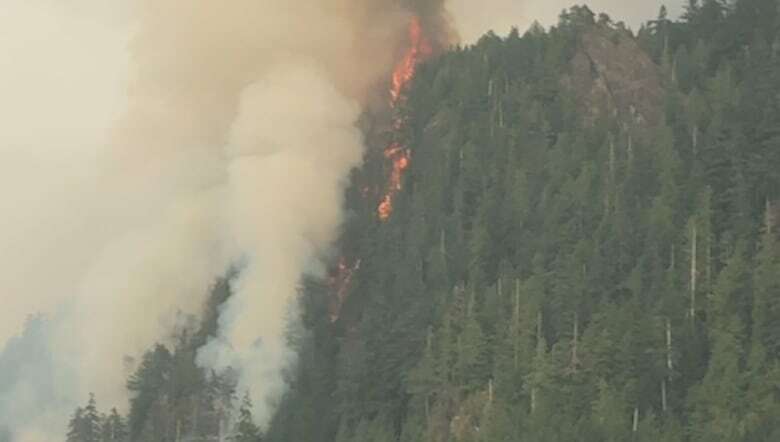 's Interior and West Kootenay regions have been cancelled or delayed as wildfire smoke continues to choke the province. Kelowna International Airport, Penticton Regional Airport and the West Kootenay Airport in Castlegar all reported several flights cancelled by noon PT Sunday. Sean Parker, the on-call airport manager in Kelowna, said there's less than one kilometre of visibility, which means smaller planes can't land safely. Parker says he hasn't seen such thick wildfire smoke in years. "To be honest with you, I've personally never seen it this bad," he said. "You look out the window here in Kelowna​ … It's like we're in a fog." In a statement, Air Canada said its flights to and from the Interior could continue to be affected due to smoke and visibility. Those with travel plans are advised to check the flight information page on their airport's official website or social media channels. Andrea Purcell arrived in Vancouver from Toronto on Sunday at 2 p.m. PT only to discover her Air Canada flight to Castlegar was cancelled due to smoke. She is spending the night in Vancouver and will drive to Castlegar on Monday, but says she wishes the airline did more to help her. "I would have stayed in Toronto longer had I known," she said. Environment Canada said much of the province is under a special weather statement because of smoke. Only the far north and part of the western coast are clear. Air quality in Castlegar, Kamloops, Prince George, Quesnel, Whistler and Williams Lake was set at a "very high" health-risk rating of 10 or higher on Sunday. The Okanagan, eastern Fraser Valley and Metro Vancouver regions had the same rating. The elderly, children and people with pre-existing health conditions in those areas should stay inside. The conditions forced some people to change their plans, such as not spending the weekend outdoors or cutting camping trips short. That's what Anita Sparrow and her family did at Golden Ears Provincial Park east of Vancouver on Sunday. "It's supposed to be 33 C, clear skies," she said about the cool temperatures due to hazy conditions. She says the conditions made her feel like she had a cold. One of her children has been having to use an inhaler. Still, she says it could be worse, considering the South Coast is mostly just suffering from smoke and not flames. "We're lucky here, so even for us to say, 'Oh it ruined our vacation,' well it's ruining peoples' homes, it's ruining wildlife, it's ruining full communities, so I feel blessed living in this part of B.C." 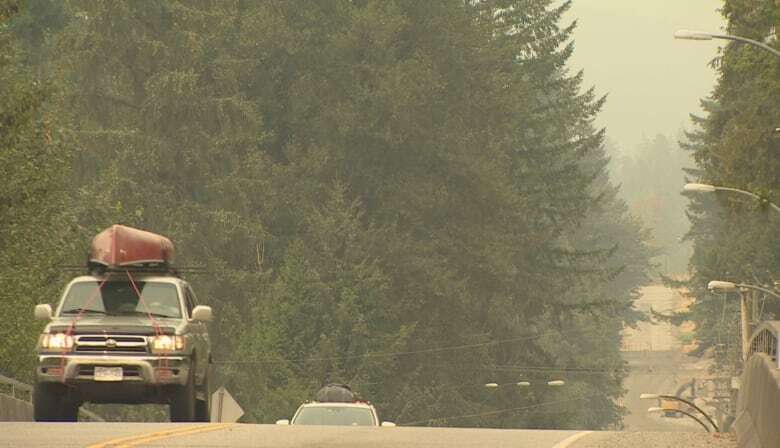 Environment Canada meteorologist Allan Coldwells said smoke "is going to be an issue for the next five days," compounded by even more smoke that has floated north from wildfires in Washington state. The status of the wildfires across the province has largely held over the weekend. 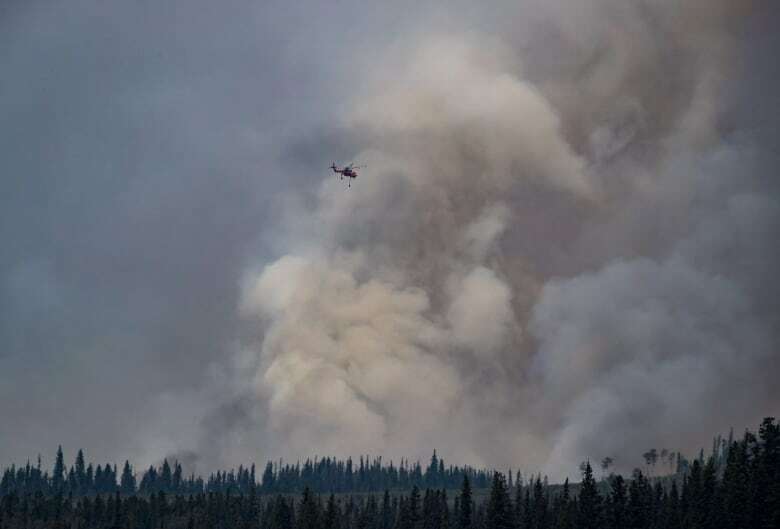 On Sunday, fire information officer Kyla Fraser said the corridor between Smithers and Prince George is still the biggest area of concern given the size and intensity of the fires there. 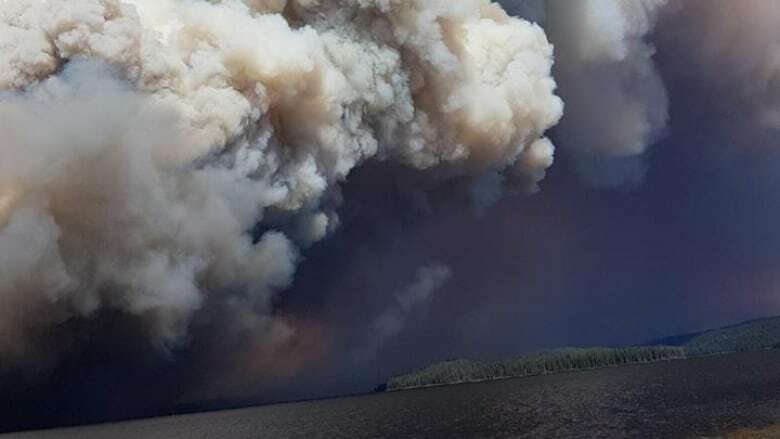 The Shovel Lake fire — the province's largest — has scorched 85,000 hectares west of Prince George. 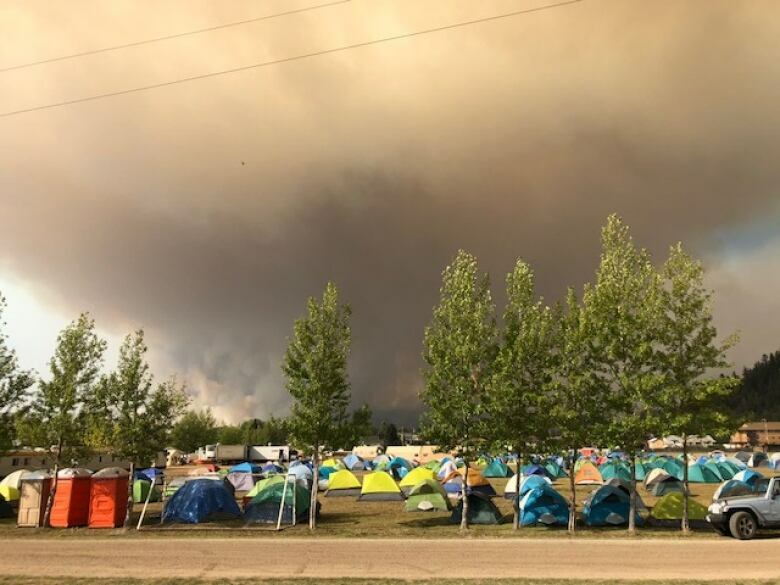 In the southeast corner of the province, thousands of people in Kimberley are still on evacuation alert. Fraser said the nearby Meachen Creek wildfire stayed relatively the same size on Saturday night. B.C. is in its fifth day of a province-wide state of emergency. There are more than 560 wildfires burning across the province. More than 100 Canadian Armed Forces have been deployed to help B.C. personnel. Wildfire smoke over western Canada is visible from NASA's DSCOVR satellite — about 1.6 million kilometres away.